Special Day Cars are very proud to be able to offer our beautiful 1965 Rolls Royce Silver Cloud III. 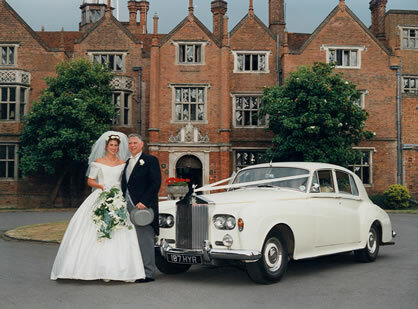 Probably one of our most sought after wedding cars this car is effortlessly elegant. The wedding white coloured car can be dressed with ribbons to match your colour theme. The car is also supplied with the all important bottle of chilled champagne. This classic Rolls Royce was built in 1965 and is beautifully finished in cream with a beige leather and burr walnut trim interior. The rear compartment features picnic tables, vanity mirrors and electric windows. It is the last of the ‘proper’ Roll Royces and incorporates modern motoring with elegantly classic styling. The Daimler Limousines make an ideal second car, or alternatively the Rolls Royce Open Tourer and Rolls Royce Silver Cloud make an impressive pair.